When science-fiction writer Douglas Adams, the author of Hitchhiker's Guide to the Galaxy and much much more, keeled over from a massive heart attack while exercising on May 11 2001, this holiday--Towel Day--was born! And, even though he died on May 11, it is celebrated today, May 25, as an homage to the author. The towel is taken from the novel, and is a reference to the character's, Ford Prefect's, proclivity for taking a traveling towel with him wherever he went in the the galaxy. Ford instructs the main character, Arthur Dent, on the tremendous importance and uses of the towel. Arthur is encouraged to never be without one, for anyone who is anyone takes a towel with him wherever he travels in the universe. The holiday is celebrated by wearing or carrying a bath towel (around the neck or tucked into a waistband) all day long, but there are other ways to celebrate. Figure out the meaning of Life (the Universe and Everything). Hang banners that say, "DON'T PANIC"
Here is a video with detailed instructions for using a galactic traveling towel properly. 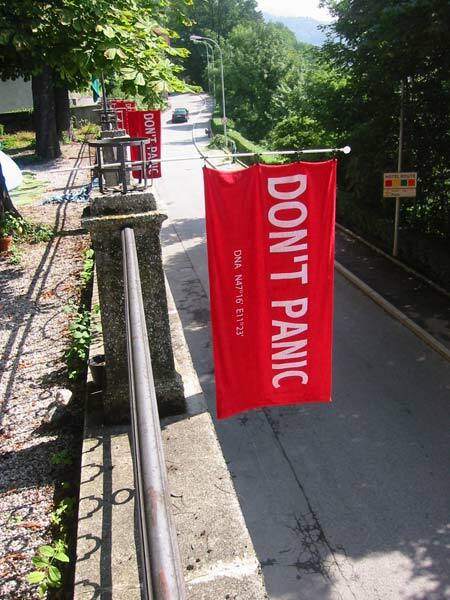 Towel Day has it's own website towelday.org; and a Wiki Page. Here are Hitchhiker's-related books. You might want to look at FAQ about the holiday. The farthest I go is to the drug store, and I've managed to lose my towel.